Publisher: Crosby Lockwood And Son, 1907. Hard Cover, 562 pages, 5.5 x 7.5. 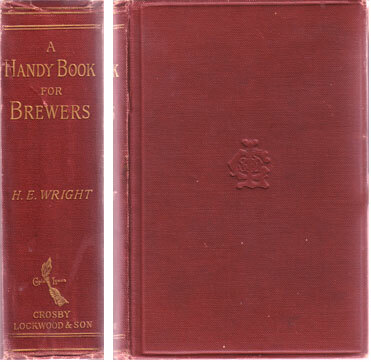 Here is the 1907 third edition of Wright's A Handy Book For Brewers. It is a complete, 562-page reference book for practical brewers. These types of handy books were popular around the turn of the century. They were meant not so much as classroom text books, but as quick-reference books for active brewers and students in training. This was the type of book that a good brewer would normally carry in his back pocket for daily consultation in the brewery. As a result, many of these guides are abnormally scarce  they were heavily used on the job and often did not survive intact.